These systems eliminate the need of installation of multiple cables and use of voluminous and inconvenient audio-mixing consoles. Thus the risks from unwanted feedbacks and microphonics are eliminated. The use of quality microphone systems and the correctly planned number of microphone consoles are a key factor for achievement of comfortable environment for the participants in the discussion. It is important to bear in mind also who will work with the installed equipment – the systems offered by us are envisaged to work faultlessly, after the initial adjustment, without any need of permanent presence of qualified operator. Once installed and adjusted by a specialist of ours, the equipment will work in the best way, without any need of permanent adjustments and configuration. Congress Engineering offers design and assembly of professional discussion systems for small conference halls, discussion halls of average size and big conference halls with multiple participants. The discussion systems offered by Congress Engineering are completely digital, with integrated modules for control of the discussion for elimination of the microphonics and built-in automatic modules for making digital audio recording. Such systems are intelligent solution for automatic restriction of the number of active delegates, which preserves the clarity of speech, eliminates the unwanted noises in the room and sets consistency in discussion. The systems have also chairman’s microphone consoles with enhanced functions and priority button. The microphone consoles of the discussion systems dispose of built-in loudspeakers directed towards to the delegate. This loud speaker allows in some cases the system to be used without any need of additional sound in the discussion hall. Congress Engineering first presented to the Bulgarian market the new wireless conference system of Bosch, which makes the conference events more pleasant and more productive than ever. Standard Wi-Fi – technology for joint work with other Wi-Fi networks. Smart Wireless Management –guarantees work without disturbing the wireless connection. Wireless microphone consoles with built-in touch screen and NFC reader – for unsurpassed experience and future possibility for expansion. Direct wireless connection for easy configuration and control, without need of additional router. Maximum flexibility and Zero Audio Disturbances. 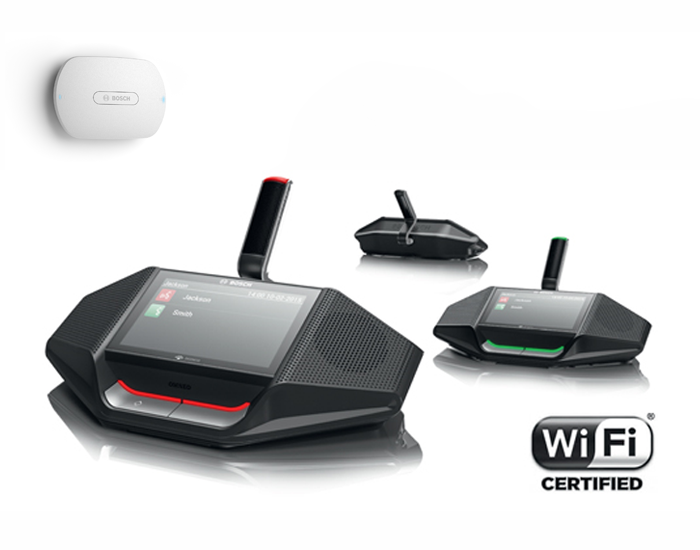 The innovative wireless conference system DICENTIS uses state-of-the-art technologies in the Wi-Fi standards and Smart Wireless control to guarantee wireless connection without any disturbances. Designed as the most flexible discussion system ever created, it enables quick and easy adjustment both for small meetings and big conferences. We present to you the newest digital conference system CCS 1000 D from Bosch! CCS 1000 D impresses with its simplicity and ease of use, and all this disposes of the most advanced technological innovations. 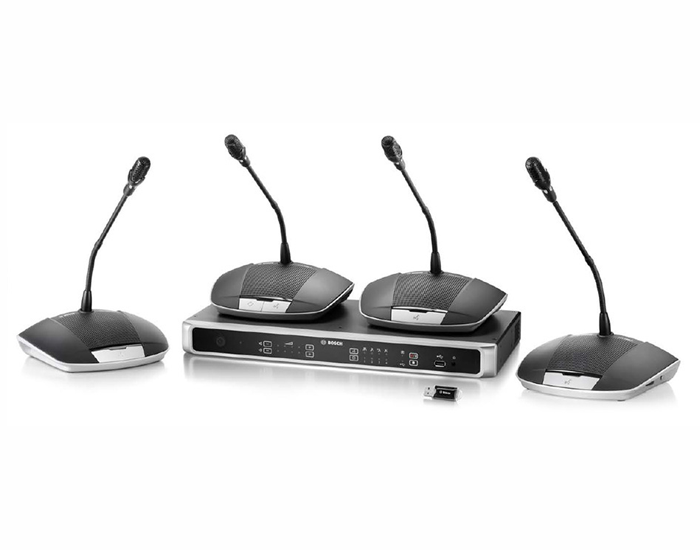 CCS 1000 D is compact digital discussion system, easy to adjust and use. It provides enhanced functions and extreme flexibility, which make it ideal solution for any meeting and conference halls. 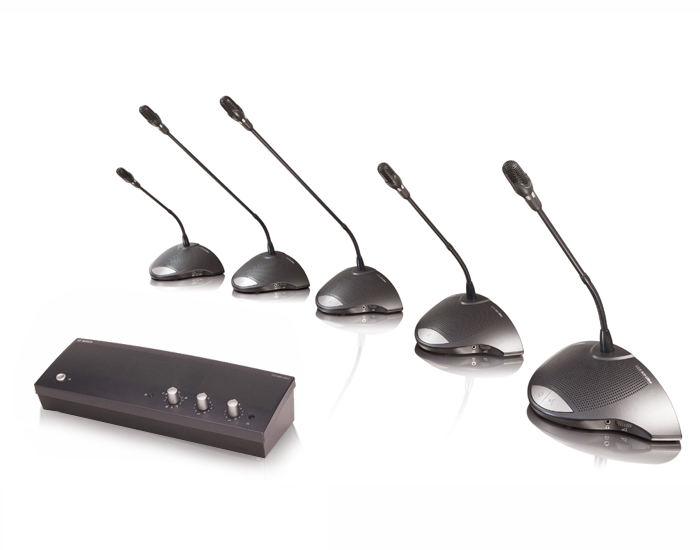 Designed for plug-and-play, ease of use and high-productive meetings… Excellent speech intelligibility with built-in digital module for elimination of microphonics. Built-in audio MP3 recording module of internal memory and/or USB flash memory. Management of the automated HD camera. Enhanced configuration and management through built-in web server. Saving of energy in automatic switching off after 2 hours lack of activeness. Sensor buttons for exclusive experience with the work with the system. The accessible digital discussion microphone system! Ideal for small and medium meetings, as in the municipal councils, court rooms, business centres and conference halls and others. The DCN-D Discussion Unit is an additional unit to the Digital Congress Network (DCN) Next Generation system by Bosch. It is suitable for use in everything from small discussion setups to more complex, multilingual meetings. As with all DCN Next Generation delegate units, unique design is combined with the renowned and intuitive Bosch user interface that allows users to relax and enjoy the speaking and listening experience. With DCN Next Generation and the new DCN-D Discussion Units, your meetings are always in good hands. The DCN-D Discussion Unit has a stylish and unique appearance with a streamlined, modern design and elegant dark charcoal and silver matt finish. And for the perfect fit with the décor of all types of conference rooms, matching colored microphones (dark charcoal and silver white) are available. The design of a discussion unit plays a key role in how people interact with each other at meetings. It also has a vital function in creating an environment that encourages constructive dialog. Striking the right balance between aesthetic appeal and ergonomic efficiency, combined with its knowledge about intuitive interfacing, is what give Bosch an edge in helping delegates to focus completely on their speech while using the units. What’s more, enhanced acoustic and display technologies make it easy to hear and read exactly what is going on, so even new users feel at ease and in control. And that’s good news for every conference, no matter what the topic. 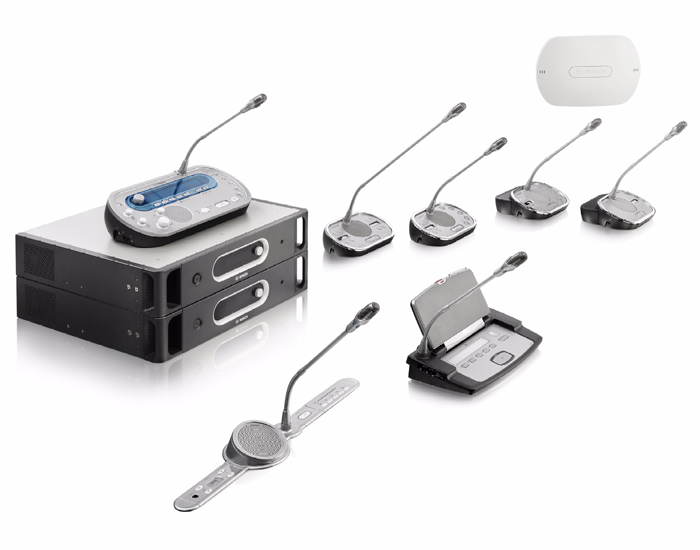 Aesthetic, compact discussion system Known for world-class solutions for congresses and conferences, Bosch introduces the compact but advanced CCS 900 Ultro Discussion System. Designed and developed by Bosch experts in Europe, the system makes it extremely easy to manage meetings and is ideal for small- to medium-scale meeting areas, such as town halls, local business centers and courtrooms. The new design complements any interior, from new, ultramodern buildings to traditional, centuries-old structures. It delivers Bosch’s high quality with improved acoustical characteristics and excellent speech intelligibility. 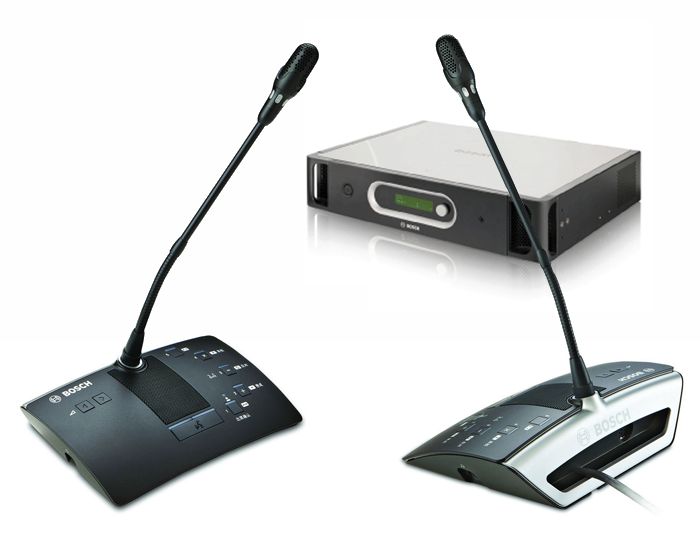 Compact but complete This all-in-one system features the new, patentpending “Possible-To-Speak” function that gives delegates a visual indicator when the microphone is available for use. Also, there are four easy-touse operating modes for more focus on the conversation and digital acoustic feedback suppression to avoid howling. Intuitive controls and flexible installation make the authentic CCS 900 Ultro the best possible choice for a wide range of meeting environments. Excellent speech intelligibility and delegate management In small- to medium-sized applications, like townhalls or courtrooms, there may be different types of discussions, but they all need excellent speech intelligibility. The CCS 900 Ultro, a flexible solution for this type of venue, makes it easy to conduct meetings without an operator. The chairman can guide the discussion, allowing individual delegates to speak or letting several delegates take the microphone simultaneously. Delegates are guided by a visual LED to know when to speak. The daisy-chained system has an intuitive interface and is fast and easy to install. The system can easily handle external equipment like handheld microphones or a public address system to allow the audience to listen to the discussion. The Digital Congress Network (DCN) Next Generation from Bosch is the distinctive showpiece of digital conference management. It brings outstanding aesthetic appeal, reliability, flexibility and control to all proceedings. Moreover, it helps you take the next step in conference management. That’s because Bosch designers have worked intensively together with experienced delegates, interpreters and operators to create a system that satisfies everyone in the entire conference chain. In short, with the Bosch DCN Next Generation, you can relax. Your meeting is in good hands. The DCN Next Generation has already earned global recognition, offering advanced, proven features that maximise meeting efficiency and productivity. On its most straightforward level, it effortlessly handles speaking and listening without the need for an operator. At its most advanced level, it is an integrated and multilingual communication infrastructure for facilitating and managing the most complex of international conferences – conferences that can host thousands of participants coming from all around the world. What’s more, with the DCN Next Generation you also benefit from the support of Bosch – a reliable and established partner with many years of experience. A partner with a renowned, worldwide network of professional service engineers. That’s why, when people think of conferencing, they think of Bosch. The DCN Next Generation line includes many different options to ensure an exact fit with your needs. Whether it’s a compact table-top or a tailored flush-mount, every unit is equipped with oschdeveloped technology, such as high-quality plugable microphones, special loudspeakers for perfect intelligibility and all being completely immune from mobile phone interference. Other options include electronic voting, ID cards and built-in channel selectors that offer up to 31 channels for simultaneous interpretation. Design plays a key role in how people interact with each other and is a vital part of creating an environment that encourages constructive dialog. The DCN Next Generation, with its sleek control panel and intuitive layout, has an instantly familiar feel. Advanced acoustic and display technology makes it easy to hear and read exactly what’s going on, so even new users feel at ease and in control. And that’s good news for every conference, no matter what the topic. When language interpretation is needed, soundproof booths can be equipped with DCN interpreter units. Each interpreted language is automatically distributed to headphones connected to delegate units or flush-mount channel selectors. To give delegates greater freedom of movement, interpreted languages can also be directed to wireless Integrus pocket receivers.